Great romantic birthday wishes have exactly the right dose of passion and affection to sweep anybody off their feet and …just like the cupid-approved birthday messages I have here. As American actress, model, author and musician Sasha Grey once said, "a shiny ring isn't romantic to me. I think thought and love into what you do for the person you're in love with - that's romance." I agree. If you agree, put some thought into choosing your romantic birthday greeting. 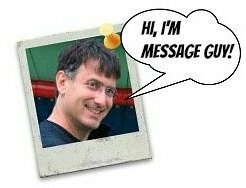 If you need some assistance with picking a romantic message, you can always click here to check out Message Guy #49, a treasury of helpful hints on this very subject. Happy birthday, my little ray of sunshine! You light up my life like a thousand suns. You always make me feel so warm inside. Happy birthday! Every moment I spend with you fills me with such joy. You make me see how amazing real love can be! May your birthday be filled with our love multiplied by 1,000,000! Happy birthday! On your special day, you will be getting more than cake and gifts — you will get every ounce of my love. Happy birthday to my best friend and girlfriend. To everyone else, you're my wife. To me, you're my life. There’s only one birthday gift that comes close to how I feel about you — the gift of my love. Happy birthday, my darling! Happy birthday! You are the love of my life and my dreams. With you, everything feels just right, perfect! Wishing your birthday is just as perfect! 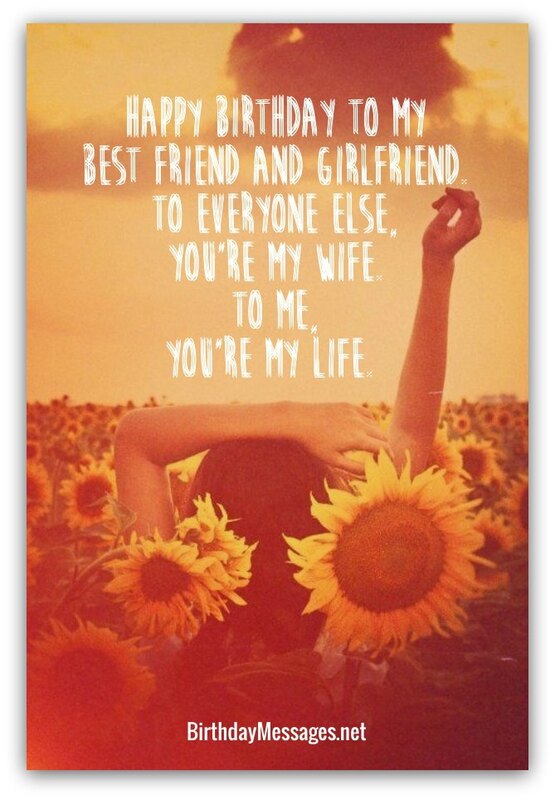 I hope your special day is perfect, like you, like our love, like our future, like everything…when I'm with you. Happy birthday, love! My birthday gift for you is as incredible as the universe and as life-changing as an atom — it’s all my love wrapped in hugs and kisses. Happy birthday, lover! Romance is all around you! Whether I’m at my lowest lows or highest highs, your love lifts me up, higher than I've ever been. Now let me lift you even higher on your special day. Happy birthday, my sweet! The light you bring into my life not only brightens my world — it makes feel like I’m walking on sunshine. 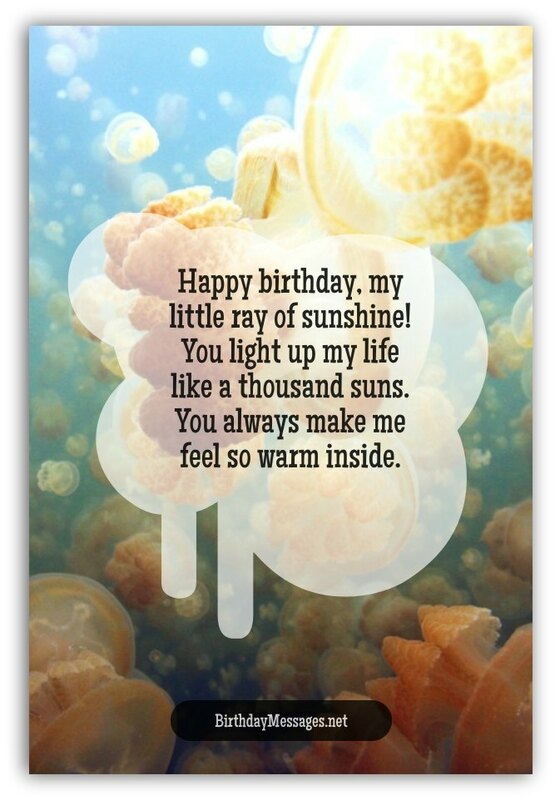 Happy birthday, my sunshiny love! Our love is stronger now than the first day we met — and will ultimately be even stronger than the test of time. You are my greatest love. Happy birthday! Happy birthday! We’re more than a match made in heaven — our love is written in the stars. Let’s celebrate your special day as one. On your special day, I will spoil you more rotten than anyone ever has. You deserve 24 hours of pure love and joy — and I want to give it to you. Happy birthday! When we're in each other's arms, everything’s better. On your special day, let's stay in bed and never let go. of each other Happy birthday, my huggy bear! Happy birthday to the love of my life. I’m so completely, utterly, absolutely, wholly, unreservedly, totally, thoroughly and, most of all, perfectly in love with you! You're all my fantasies rolled up into one...one beautiful, loving, caring, sensitive, strong and just all-around wonderful person. Happy birthday! Every day shines brighter when you're in it. Today, I hope you let me shine my love on you so bright that it rivals the sun. Happy birthday!